Performing to an appreciative audience doesn’t always mean having to pitch a venue, schedule a gig, and pimp it far and wide. In fact, many skilled and experienced musicians choose to take their tunes to the streets, playing to informal audiences at train platforms, thoroughfares, and parks everywhere. Busking — a.k.a. street performing — can be a great way to hone your performance skills, bring your music to fresh ears, promote your shows and CDs, and earn some cash at the same time. But there are barriers to overcome, including knowing the law and overcoming the fear of performing in such an intimate and unfamiliar setting. Here are some tips from experienced buskers to help you make your own street performances successful. When you decide to busk, the last thing you want is to have your spellbinding street performance interrupted by a ticket-wielding police officer. A quick internet search should give you a good idea of what’s legal when it comes to public performances in any given community, and a call to a local police precinct or town hall won’t hurt either. Be sure to ask not only about performing publicly, but about accepting tips or donations, and selling CDs, as well. (Ed note: See the links below for some resources to check out for legal info). When it comes to laws, every community is different, says Charith Premawardhana, a violist who busked extensively for two years while a conservatory student. “I had a friend get a ticket for busking in Golden Gate Park in San Francisco, for example, but if you’re unamplified, you can play pretty much anywhere else in the city,” he says. Natalie Gelman, a singer, songwriter and native New Yorker, has nearly a decade of busking experience. She has received only one ticket during her career. “Generally, the cops will respect what you’re doing as long as you’re not making too much of a crowd, and if you’re respectful of them as well,” she says. Whether you’re playing in a train station or local park, the less gear you have to lug, the better — especially if you have to relocate on the fly due to rain, law enforcement, or any other number of factors outside of your control. There’s no magic formula by which to choose the ideal spot and schedule for your busking forays, so observation, trial and error, and word of mouth are good paths to follow. Safety is also a concern, and Gelman recommends busking in an area that is both well lit and provides you with a solid wall, statue, fountain, pillar or other structure behind you. When it comes to timing, again, observing your local environment and asking around can give you an idea of when to strike. 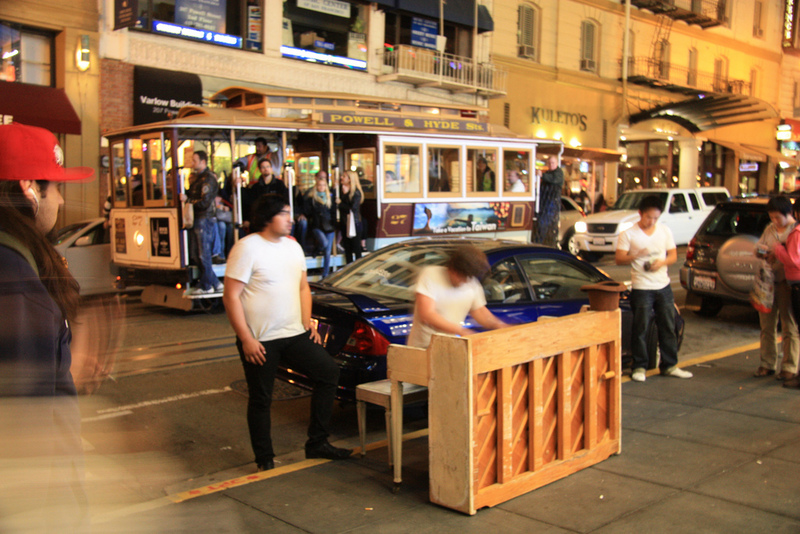 When playing classical music in San Francisco train stations, Premawardhana preferred early and late rush hours for maximum foot traffic; in New York City, Pattillo recommends between 10 AM and 2 PM in order to intercept music-friendly parents and babies, as well as the post-dinner rush when tipsy New Yorkers jump from one bar to another. Pattillo agrees, pointing out that busking can give you valuable experience in front of a crowd, even if you don’t earn a cent doing it. “I practice a lot in the practice room, but the second you have eyes on you, it changes the entire experience of performing,” he says. Since busking isn’t generally as regulated as a club gig, it’s important to be aware of your fellow street performers. That means showing up early to claim prime busking locations, being friendly and respectful towards others busking musicians, and standing up for yourself when you need to. Michael Gallant Michael Gallant plays eclectic indie rock with Aurical and will be releasing his first solo instrumental album in early 2013 with the Michael Gallant Trio. He writes, produces, sings, and plays keyboards for the indie rock band Aurical. He is also the founder of Gallant Music, a custom content and music creation firm based out of New York City. For more, visit auricalmusic.com and gallantmusic.com. Follow him on Twitter at @Michael_Gallant.